When you leave the office, many times you need to carry reference materials. Instead of carrying a laptop around with your office applications and current versions of your original data files, you can simply carry a Palm PDA with Documents To Go. You can then be sure that the latest version is with you, since Documents To Go automatically converts, optimizes and synchronizes your documents between your PC and Palm. With Documents To Go's handheld word processing application, you can even create new files on the Palm and synchronize those files with your PC. This application isn't just a simple text editor -- it supports bold, italics, underline, justification, indentations, auto bullets, line numbering and even tables! This DataViz technology offers two important advantages -- your desktop files don't have to be specially formatted and the documents on the Palm device are editable. This technology surpasses both Adobe's PDF format and peanutpress's e-book format when using documents under your control, because these other methods do not allow editing from the Palm platform. Being able to make quick revisions to your important documents from the Palm should make a great improvement to your workflow. It changes the way you can work, since the Palm is no longer just an electronic reference manual, but it now can function as lightweight notebook. You can "beam" documents to other Palm users. "Beamed" documents can be recreated into the original file format on a desktop computer if you have Documents To Go. This makes a unique backup method for critical files. Files are compressed to a fraction of their original size to saves memory on your PDA. 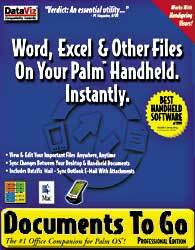 Documents To Go appears to be an essential program for all Palm users.